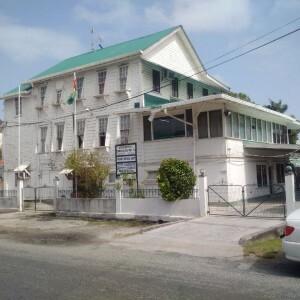 The headquarters of the National Industrial and Commercial Investments Limited (NICIL), Barrack Street, Kingston, Georgetown. The balance of payment of a hefty US$5M owed by a Chinese company for the sale of shares at telecoms company Guyana Telephone and Telegraph Company (GTT) has already been paid off. This is according to sources close to the recent trip to China by Minister of State Joseph Harmon to ascertain the position of that payment. It is unsure when the Chinese company would have paid off the US$5m owed on the shares, but according to reports the sum was never accounted for. Then Head of the National Industrial and Commercial Investment Limited (NICIL), Winston Brassington had said that diplomatic and legal options had been explored to get the Chinese company, Datang Telecom Technology and Industry Group, to pay the outstanding sum. An official release from the Ministry of the Presidency said that Harmon and in-house Legal Counsel at NICIL, Natalia Seepersaud, made the official trip to the People’s Republic of China for the purpose of engaging in discussions with Datang regarding the US$5 million balance owed for the purchase of 20 percent of the GTT shares. The Chinese company had made the purchase from NICIL in 2012, entering into agreement with the then People’s Progressive Party Civic (PPPC) administration. The total cost of the GTT 20 percent shares was said to be US$30million but only US$25million had been paid. Catherine Hughes, Minister of Public Telecommunications, could not immediately provide information on the matter since she said she was out of the country and was not privy to the information. When asked, the minister suspected that the matter would be discussed at Cabinet given its importance. “I was out of the country and not privy to any information involving the shares,” Hughes informed. “I guess given its importance, it could be up for discussion,” the Minister agreed. An audit report recently concluded on NICIL suggested that the former administration had sold out certain state assets that financed the construction of the controversial Marriot Hotel. The forensic audit conducted by former Auditor General (AG) Anand Goolsarran into the construction and operationalisation of the Marriott Hotel revealed that for the period of 2010-2013, NICIL’s financing of the Marriott Hotel totaled $5.371 billion, which included among other state property, the US$25million earned from the sale of the GTT shares. Harmon’s team to China is expected to submit their report to the Board of Directors of NICIL for deliberations. A full public statement is expected later.